I am really pleased that this new book that I helped to organise, has come together. 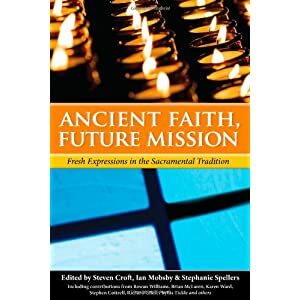 Its content includes chapters by Rowan Williams, Abbot Stuart Burns, Brian McLaren, Karen Ward, Phyllis Tickle, Sue Wallace, Ian Adams and others on the whole area of developing sacramental emerging & fresh expressions of church. You can preorder it now from Amazon or Canterbury Press. I am hoping this book will help people reimagine ways of exploring sacramentality in new ways of being church. The book includes the address of Rowan Williams and the reflection of Abbot Stuart Burns at the recent Fresh Expressions of Church Pilgrimage to Coventry Cathedral on the 8th December 2008. So this will be a good read, promise!